KFC fried chicken has always been on my list of favorites. The good thing about KFC is that they continue to innovate and add more selections to the chicken offerings. There were the KFC Pasta Bowls (chicken with noodles such as Kung Pao Chicken and Chicken Alfredo), KFC Supreme Bowls (chicken and rice such as Italian Roma and Chinese Imperial) and KFC Twister Toasted (pizza in a wrap). When I visited KFC last night, I asked for something new on their menu. Aside from the new wraps, they mentioned the KFC BBQ Rods which I didn’t notice on their overhead menu. So I tried out their new KFC BBQ Rods and was very satisfied. Inspired by the success of KFC Chicken Barbecue, KFC launched the new KFC BBQ Rods which are KFC’s crispy chicken bites with a really yummy barbecue sauce, served with java rice. 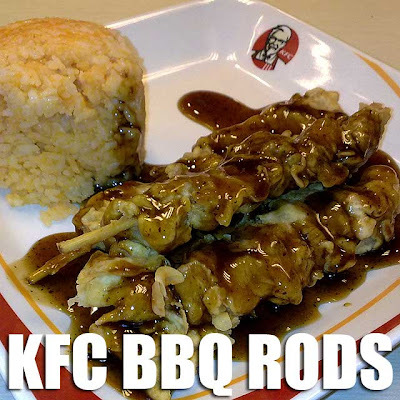 I got the three-stick KFC BBQ Rods meal which includes java rice and a drink for Php95. This new and innovative lunch offering from KFC is the same finger lickin’ chicken they are known for, only in a stick. And the price is quite affordable for a rice meal. They also have the two-stick meal if you don’t have too much of an appetite. 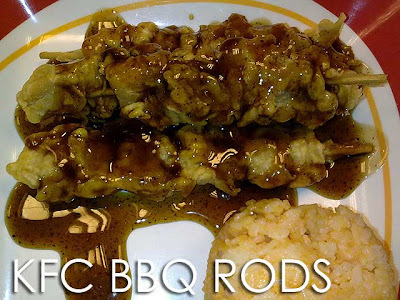 If you do visit KFC, I suggest you try out the KFC BBQ Rods.